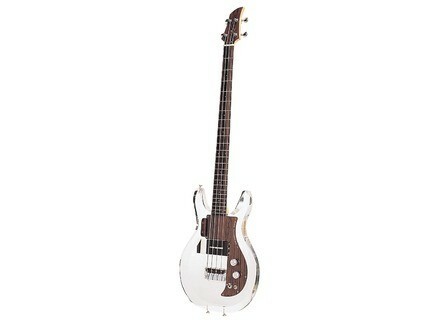 ADA4, 4-string bass guitar from Ampeg. The Ampeg ADA4 is a near-exact replica of the original Ampeg Dan Armstrong "Plexi" bass. The new ADA4 ($1,899.99 list / $1,399.99 MAP) features the same eye-catching clear acrylic body and unique sound that made its predecessor an immediate hit among iconic bassists of the era. The ADA4's maple neck features 24 frets inlaid into an Indian rosewood fingerboard, which when combined with the unique diamond-cut acrylic double cutaway body allows a full two-octave access clear of the bass' ultra-thin body. The re-issue benefits from an improved bolt-on neck joint, as well as a solid rosewood bridge with compensated brass saddles. This bridge couples directly to the bridge plate enhancing tone and sustain, while the bridge plate, which is also the string holder (tail piece), allows the most efficient string-to-body contact available. Custom removable pickups by Kent Armstrong, who designed the original guitar and bass pickups for his father in the '60s and '70s, employ a unique stacked design where the tone control mixes the treble and bass coils for a depth of tone that belies the instrument's 30-inch scale. Two pickups are included with the bass: "Bright Bass" and "Deep Bass." Additional instrument features include nickel Grover tuners, vintage rotary volume and tone pots with a two-way switch, and an authentic Formica pick guard with aluminum backing for electronic shielding and maximum durability. "Dan Armstrong's designs for Ampeg were so far ahead of their time back in the late '60s that, even today, these guitars are still completely fresh and innovative," says Paul Meisenzahl, Ampeg director of product marketing. "With the re-issue of the classic 'see-through' bass and introduction of the affordable new wood-body AMG100 guitars, musicians now have even more options to enjoy the radically cool styling and spectacular tones that were Dan's genius and legacy." The Ampeg Reissue Bass, along with other new Ampeg/LOUD products for 2008, will be on display in booth #5776 (Hall B) at the NAMM Convention in Anaheim, California, from January 17-20.